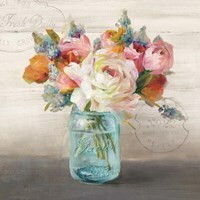 This floral still life by Barbara Mock is painted in a warm burgundy with subtle eggshell white and terra cotta brown. By using a rustic brown patina finished backdrop, Mock is able to make the vase of lilies and rhododendrons in the forefront pop. Subtle, soft and relaxing, “Autumn Lilies” is a perfect art print for a classically styled house. 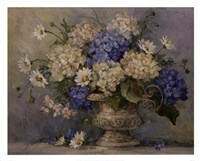 Best framed in a classic styled gold or silver frame to pick up the white and yellow hues, this still life would fit best in a library, dining room or living room.